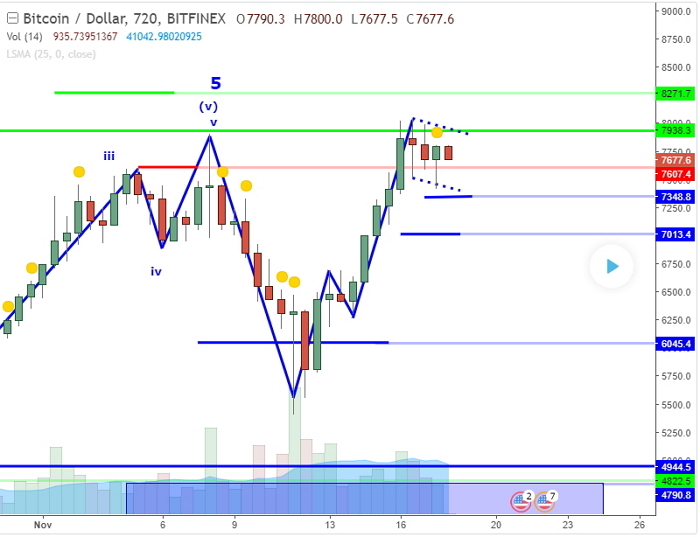 Bitcoin closed the past trading week with an attempt to test the next major level – 8000 USD/BTC. In particular, the world’s first and biggest cryptocurrency has come close to the threshold on November 17th by setting a new all-time high at 7997,17 USD/BTC. However, this was a short-term attempt and the price retraced a bit shortly after setting the record. It’s interesting to note that Bitcoin started the trading week with a 30% crash. This made its market cap drop by as much as 38 billion dollars at a time. The crash was triggered by the news that the developers decided to abandon the idea to use the SegWit2X technology. Apparently, this made many investors quit the BTC market for other digital currencies. For example, Bitcoin Cash nearly doubled it’s price and market cap over the same period. However, as we have already mentioned, Bitcoin managed to recover and even raise further up to a new all-time high close to the $8000 threshold. Blockchain Capital’s CFA Spencer Bogart thinks that the Bitcoin rally seen at the end of the week was triggered by the fact that the investor interest in SegWit2X (as well as its viability) had revived by that time. In particular, he claims that there is a team of developers who keep on working on SegWit2X, and that’s why savvy investors start moving back into Bitcoin to hold the assets at each of the 2 sides of the fork. At the same time, the BTC rally is said to have been backed by the rumors that the CME is going to launch the beta testing of BTC futures on November 20th, NordFX experts report. Panos Mordukatas, professor of economics at the University of Long Island, thinks that Bitcoin still has a lot of upward potential. He expects the digital currency to skyrocket all the way up to $10K for 1BTC by the end of the year. The expert says that Bitcoin has passed two major tests – the Wall Street test and the Chinese test – which made big-scale investors change their mind about cryptocurrencies.